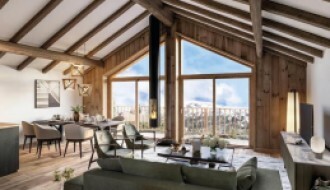 Chalet Blanc is a beautifully presented property with quality fixtures and fittings throughout. It is an ideal family holiday home – built in 2008, it is low maintenance, lock-up-and-leave, near the ski slopes and village amenities. The property is spread over three levels, and offers spacious and well laid-out accommodation. The property is entered on the ground floor, via a handy ski room, perfect for swapping ski boots for slippers, and offering secure storage for all your kit. The ski room leads through to a large games room, ideal for the kids on a rainy day or for family games in the evening. Through the main entrance door is a double bedroom, and a large bathroom with ample space to hang wet gear at the end of a day on the slopes. A walk-in cupboard under the stairs provides useful storage. Upstairs, the middle floor is open plan, and is lovely and is both airy and cosy. The well-equipped and stylish kitchen has a double-height ceiling, giving a real feeling of space. 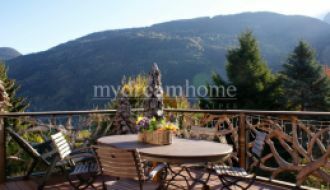 The large balcony leading off the kitchen has beautiful views across the valley and space for a dining table and 8 chairs. The dining area and lounge with wood burning stove is cosy but light and spacious. Completing the middle floor is a double bedroom with en-suite shower room. To the rear of the property, accessed from the lounge area and bedroom, there is a small landscaped south-facing garden with large deck. On the top floor, there is a galleried landing with handy linen closet. Off the landing is the very spacious master bedroom with balcony and en-suite bathroom. There is a second large double bedroom with balcony, and a separate family bathroom. The chalet is located between the ski station and the village of St Jean d’Aulps. 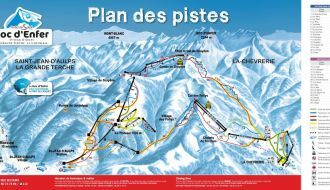 It is within walking distance of both, but although the ski lifts are under 500m away on foot it is along a footpath and in ski boots may be a challenge! Fortunately, the chalet is also on the ski bus route, about 100m from the nearest stop. The ski resort of St Jean d’Aulps is a friendly, relatively small, but growing resort. 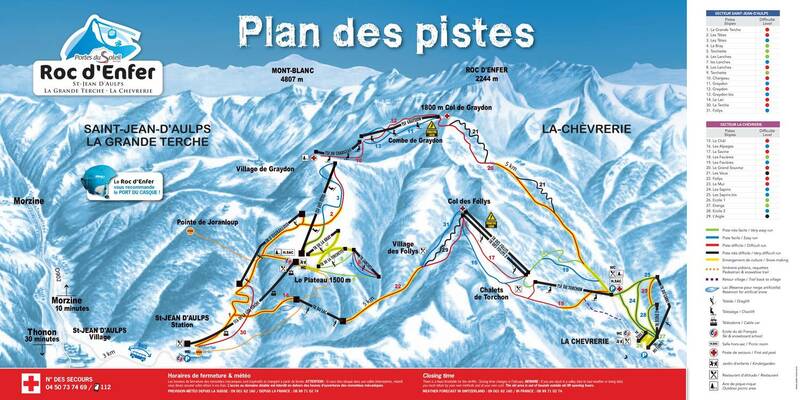 It is part of the much larger Portes du Soleil skiing domain, with Morzine approximately 10 minutes away by car. The resort also provides and handful of bars, restaurants and shops, and a free shuttle bus that operates to the village centre and back in the winter. The village of St Jean d’Aulps has a couple of restaurants and lively bars, a local supermarket, a butchers, a boulangerie, a pharmacy, a post office and doctors surgery. Access to the international ski resort of Morzine-Avoriaz is approximately 10 minutes away by car, and Geneva airport is under 90 minutes away.